The idea of collapse is bad enough for most people when it deals with the running out of mineral resources along the symmetrical "bell shaped" Hubbert curve. But there is an extra dimension to collapse: it is the "Seneca Effect" (or "Seneca Trap", or also "Seneca Cliff") that notes how, most often, when things start going bad, they go bad fast - even very fast. So, a few years ago I started mulling over this idea, also as the result of a question that Dmitry Orlov had posed to me. I also remembered something that the ancient Roman Philosopher Seneca had written and that a friend of mine (Luca Mercalli) had pointed out to me. The result was the "Seneca Collapse model," one of a series that I call "mind sized" simple models. The basic idea of the Seneca Model, as I implemented it, is that a complex system, such as a whole civilization, does not collapse just because it runs out of resources, but also because of side effects related to the consumption of these resources, effects that we would call today "pollution". Trapped in between depletion and pollution, the system collapses even faster. This is why I call the effect also the "Seneca Trap". After I had developed that first model, I discovered that the phenomenon may be more complex and that there are many real-world systems that can be considered as affected by the Seneca Trap. It can be applied, in particular, to fisheries. On the whole, it is a fascinating subject that I am still exploring. The question that I am trying to answer now is what exactly causes the Seneca Effect. Eventually, everything that moves in the universe does so because of the dissipation of thermodynamic potentials. But there is nothing written in the laws of thermodynamics that says that ruin should be faster than fortune, as Seneca had said long ago (and he didn't know anything about thermodynamics). So, I believe that there is something here that has to do with complexity and how the system is networked internally. But how to quantify that..... well, it may take some work. In any case, there is now a blog called "The Seneca Trap" that acts as a repository of the posts on this subject that have appeared (and will appear) on "Cassandra's Legacy." 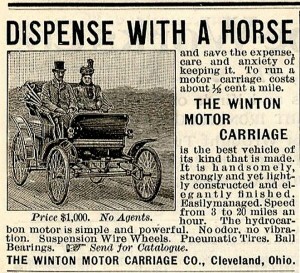 If you are interested, click on it and you'll find perhaps more on this subject than you really wanted to know! Climate change and the alien gods of the Bible: an epiphany of epistemology. 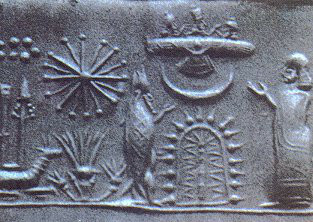 Fish-god and flying saucers depicted on an ancient Sumerian cylinder seal (image from wikipedia). Nothing real but, oh, so fascinating! As I was waiting for my train at the Milano station, last week, I toured a bookstore and I was attracted to a book titled "The Bible does not tell about God" written by Mauro Biglino. Books, books, books..... how many things are written in books? Never mind, I bought it and I read it. And here is a comment, not so much about the book itself, but about the epiphany it generated in me on how difficult it is to deal with such a complex world as ours has become. It is all, I think, a problem of epistemology, how we manage to know what we are supposed to know. And it is not easy. First of all, about ancient aliens, I have to confess to you that in my youth I wasn't just interested in that subject but, actually, addicted to it. You have probably heard of Eric Von Daniken; commonly considered the originator of the theory of the "ancient astronauts" having created the human civilization and perhaps humans as well. Perhaps you don't know that Von Daniken had a precursor who wrote under the name of Peter Kolosimo - but he wrote in Italian and hence he is not so well known outside Italy. I don't know whether Von Daniken copied from Kolosimo, but I can tell you that, in the 1960s, I devoured Kolosimo's books. A brilliant writer, a fascinating subject, a lot of fantasy. I can still find my handwritten notes about his books and I can see that, already as a teenager, I was trying to critically analyze Kolosimo's claims. I think that at least part of my interest in science and in the cycles of civilizations comes from those books. In time, I lost interest in speculations about ancient aliens. Fascinating stuff, surely, but eventually you see that you aren't getting anywhere. We have images that look - a little - like aliens or spaceships, texts that tell - perhaps - or aliens or of space travel. But nothing beyond images that look like something or texts that sound like something. Never the real thing. Never we could find anything that could be reasonably said to be a true alien artifact. I don't mean a still working ancient phaser gun, but just a little thing; say, a chunk of metallic aluminum or titanium in an ancient Sumerian or Egyptian tomb. That would have been sufficient to tell us of the presence of a technologically advanced civilization in the remote past. But nothing like that was ever found. So no alien astronauts in our remote past. Too bad, but in time I discovered that ancient civilizations are fascinating in themselves; no need to assume that they were created by god-like alien beings. Yet, the subject remains fascinating and you can understand why I picked up Biglino's book in that bookstore in Milano. It is a book that continues the line that started with Kolosimo in the 1950s; but in a more specific way. Biglino is specifically focused on the Bible that, according to his interpretation, tells us of an alien race of beings who, somehow, ruled over humans in ancient times. Not just that, but they had actually created humans as their servants in a sort of genetic laboratory called "Paradise." Now, I don't think I have to tell you that these ideas of Mr. Biglino are, ahem..., let's say, a little difficult to consider as fact-based. But the point I wanted to make here is to note how difficult is to understand the complex world in which we live. So, when Biglino starts discussing evolutionary biology and genetics, something that takes about the whole second part of the books, well, I don't want to be nasty about that. Let me just say that I can hardly imagine a clearer examples of how difficult it is to deal with fields that are not part of one's core competencies. The interesting part of Biglino's book, however, - the one related with my "epiphany - is when he deals with something that he should know well; that is the text of the Bible in its original language. It seems that Biglino worked for ten years with a reputable publisher ("Edizioni Paoline") at translating the version of the Bible known as the "Masoretic Bible" This, at least, can be verified. And, indeed, this section of the book gives a much better impression of competency on the part of the author. Biglino interprets his philological analysis as implying that the entity called ("Yahweh") in the Masoretic Bible is not "God", but a local warlord engaged in the conquest of as much territory as possible. The faithful will consider this as wrong, if not outright blaspheme (and, indeed, Biglino has been cast as the Antichrist in some websites) but, at least, it doesn't involve speculations on alien beings engaged in genetic engineering. I don't think it is interesting here to discuss who was this Yahweh, really, although many of Biglino's statements seem to be already known and to have been discussed by other authors. But here comes the epiphany. First of all, as you may imagine, my knowledge of ancient Hebrew is strictly zero (as I suppose it is for most of the readers of the Cassandra blog). So, I went fact-checking over the Web and I found plenty of sites where people who claim to be as expert as Biglino (or more) in ancient Hebrew demolish (or attempt to demolish) his interpretations of the biblical text. As I was wading through these elaborate discussions, I found myself totally at loss. Who was right? Biglino or his detractors? Really, how could I tell? What do I know of ancient Hebrew? And, while I was at that, I had a sudden flash of enlightenment: it is not just a question of ancient Hebrew. I saw myself in the shoes (or, better, behind the glasses) of a normal person who has no in-depth knowledge of climate science and who is trying to understand something of the debate on climate. Clearly, such a person would find him/herself in the same position as I am in respect to Biglino's Hebrew. The average layman lacks the intellectual tools necessary to judge in a debate on climate science just as I don't have the correct intellectual tools to judge on a debate on the meaning of ancient Hebrew words. So, here is the epiphany: the real world is so complex that for each one of us there is just a tiny slice of reality where we can have sufficient knowledge to judge what's true and what's not. The rest is forever shrouded in a fog of ignorance. Now we see as in a mirror, darkly; maybe one day we'll see the truth face to face. But, for the time we can only judge on the basis of the principle of authority. About the Bible, just as about climate, we believe the people whom we trust. And herein lies the problem. There seems to be nobody left in the world we can trust. Governments? My Gosh... Politicians? Even worse. The Scientists? A little better, but...., Translators from Hebrew who see aliens in the Bible? No comment.... Never before reading Biglino's book Pilate seemed to me be so right when he said: "what is truth?" The tragic problem, here, is that discussing of alien Gods roaming the Eart thousands of years ago is an intellectual pastime we can enjoy without suffering bad consequences. When dealing with climate change, instead, we are risking our own survival, even as a species. Because this is not an intellectual game; there is something called "reality" out there. But, as Peter Sinclair recently wrote (citing Tucker) "A civilization simply cannot survive if large portions of that civilization have declared war on facts. " We can declare war to reality, but reality will win in the end. "BERQ," Biophysical Economics and Resource Quality, is a new Springer journal dedicated to the study of complex economic systems and their relation with the availability of natural resources. Note how the cover suggests the results of the 1972 report titled "The Limits to Growth" that originated this field of studies. I have big hopes for this new journal that should provide an outlet for many high-quality scientific papers. For this reason, I accepted to take the role of "chief editor" of BERQ, together with professor Charles Hall. Note that this is a journal that is supposed to operate along the traditional format of scientific publishing, that is it is not necessarily "open access". I explain the reasons for this choice in this post. This post is about how I changed my mind about "Open Access" publishing in science. Probably you have heard about this subject; there is a good article by George Monbiot where he lambasts scientific publishers saying that they "make Murdoch look like a socialist." Monbiot is not wrong: he notes first that scientists are paid by governments (that is by the public). Then, they give the results of their work for free to commercial publishers. Finally, commercial publishers have the public pay a fee to access the papers that the public already paid for. As a bad deal, it compares to the case of Esau selling his inheritance in exchange for a bowl of lentils. Already long ago I started reasoning like Monbiot and many others. The idea was (and is): why should scientists pay commercial firms to do something that they can do by themselves? Why don't scientists self-publish their results? In this way, everyone will be able to access the results of publicly funded research. So, already in 1990, I set up an open access journal, "The Surface Science Forum." It was one of the first of that kind. Still in 2012, I was in favor of open access publishing (as I described in this post). Gradually, however, I changed my mind. What seemed to be a good idea at the beginning, didn't seem to be so good after trying it. Do you know the story of the guy who jumped all naked into a thornbush? He said that it looked like a good idea to him in order to collect berries, so he put it into practice. Later on, he changed his mind. So, I tried to put the idea of "Open Access Publishing" into practice and I worked as scientific editor for two open access publishing houses: MDPI and Frontiers. Let me say that my experience with mdpi was reasonably good, while the one with Frontiers was horrible. In both cases, however, the experience taught me a lot about academic publishing. And I changed my mind about open acces publishing. In part, I changed my mind because the bad experience I had with Frontiers, but only in part. Where I noted the flaws of open access was with the current debate on climate change. It is a debate that should be, obviously, based on science. Sure, but what's science? Well, most of us would say that science is what is published in refereed academic journals. And it is here that we have the problem. Open Access publishing is one of the factors (not the only one) that greatly increased the volume of low quality scientific (or pretended scientific) publications. And that is not a good thing because it made it more difficult for the public and the decision-makers to understand what is science and what's not science. Let me explain: in my experience, the rigor of peer-reviewing submissions is not necessarily hampered by the open access format. If nothing else, serious open access publishers (such as mdpi) are extremely strict in the process. But that is counterbalanced by the presence of a large number of non-serious open access publishers. Many are simply accepting everything, provided that the authors pay. Others simply make a mockery of the reviewing process (I once received I request to review a paper and in the recommendation form there was no "reject" option). They are called "predatory publishers" and you can find an extensive (and impressive) list in Jeffrey Beall's site. You could say that a bad implementation doesn't necessarily mean that an idea is wrong. True, but the problem is deep inside the model of open access; in the fact that publishers make more money the more papers they publish. And the temptation is strong to publish as many papers as possible. This can be obtained even without relaxing the reviewing process. It is enough to publish a large number of "titles", theoretically different journals, but all managed by the same staff. The multiplication of titles costs nearly nothing to publishers but it opens up more and more possibilities for authors who, eventually, by trying different journals will hit the jackpot of a favorable combination of reviewers even for a bad paper. So, the average quality of scientific publications can only suffer. Eventually, open access publishers are simply part of a more general problem that has been affecting science since the development of the Internet. Once, scientific publishing was expensive and often required specialized staff to help in the preparation of manuscripts. But now, with cheap software tools and a website, it is easy for anyone to produce a travesty of a scientific paper, full of data and graphs and signifying nothing. For a scientist, it is normally easy to tell what's good science and what's not (not always, though...). But for most people it is not so easy. Hence, the great confusion in the climate science debate, where the anti-science lobby was able to present pseudoscience as real science and confuse just about everyone. After mulling over the idea for a while, I think I understand what we need. We need high quality science. And this high quality science must be recognizable by everyone. It would be nice if we could have high quality science within the open access scheme, but we can't forget Sturgeon's principle (99% of everything is crud). So, we should reward publishers not in terms of the number of papers they publish, but in terms of the quality of the papers they publish. And, unfortunately, open access doesn't go in the right direction. All this doesn't mean that open access is always bad. On the contrary, it has good justifications and if - say - the results of medical research can help MDs to save people, then by all means, they should be accessible to MDs and to everyone who can benefit from them. But that's not the case for most academic research. And I don't even want to say that returning to the traditional way of publishing (pay to access) is the perfect way to go. Not at all, there are many problems in the traditional system, one is the excessive prices charged by many publishers. Still, if we can reduce some evident distortions, the idea that you have to pay something for the goods you purchase is a concept that works in all markets and that encourages better quality. And if, as a scientist, you think that your work is worth being known by the general public, you have the option of diffusing your results in a blog or in another publicly accessible format. Actually, it shouldn't be just an option; it should be the rule. If you think that nothing of what you publish is of interest except for some of your colleagues, then you can't complain if they say that you are a welfare queen in a white coat. As a final note, the characteristics of academic publishing are changing all the time. There are different formats of open access that could work better than the present ones. Then, academic paper repositories such as "ArXiv" and "Academia.edu" are revolutionizing the field. They are not peer reviewed, and that offers a chance to diffuse very innovative and still uncertain results without interfering with what goes to peer-reviewed journals. Science is changing and the world is changing, maybe too fast, but we have to try to cope as well as we can. 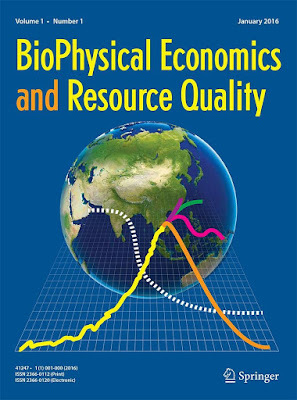 In view of these considerations, I recently accepted (*) to act as chief editor, together with professor Charles Hall, for a new Springer journal, "BERQ" (Biophysical Economics and Resource Quality). The journal is dedicated to the study of complex economic systems and of their relation with natural resources. It is, ultimately, an offspring of the early study titled "The Limits to Growth" that started a whole field of research that many of us are still exploring. I have big hopes in this new journal that should provide an outlet for many high-quality scientific papers dedicated to this kind of studies. If you are interested in publishing in BERQ, you'll find all the necessary information on the journal's website. BERQ operates along the traditional format of scientific publishing, but it can go open access if the authors so wish. It is a step along a path; the important thing is that it can give a good quality outlet for people doing good science. (*) Note: for the role of chief editor of BERQ I accepted the modest honorarium of $1500/year that I think is a reasonable compensation for the extra work I am doing for the journal. A curious vehicle carrying a mock-up of the Soviet Sputnik satellite. It was used for political propaganda in the 1950s by the Italian Communist Party (PCI). Up to the 1980s and even later, Italy was a deeply divided country where two opposed and incompatible factions squaring off against each other: the "Reds" (the communists) and the "Whites" (the Christian Democrats). Something similar seems to be taking place in the US with the Republican and the Democratic parties. Seen from Europe, the current Republican debate in the US looks completely incomprehensible. The presidential candidates, the debate, the press reports, everything seems to be taking place on an alien planet, somewhere in another galaxy. One would be tempted to define the situation, paraphrasing Darwin, as the "survival of the nastiest". Yet, there seems to be some method even in this madness. A recent paper by Iyengar and Westwood (commented in Deric Bownds's blog) generated as small satori in my mind. There is indeed a (perverse) logic in the current US debate. To explain it, I have to start from my own personal experience of when, as a child, I understood two things: 1) that Santa Claus doesn't exist and 2) that the Communists don't really eat babies. The second discovery had more important consequences than the first on my political views. When I found out that neither of the two factions dominating the political life in Italy was engaged in evil practices such as eating babies, then I started wondering what was all the fuss about. Why was Italy so sharply divided in two separated and incompatible political halves? I never could find an answer; it was just the way things were. On the one side, there were the Christian Democrats, the whites, the churchgoers, on the other, the Communists, the reds, the anticlericals. The sharp divide that separated these two sections of society didn't just appear at voting times; no, it pervaded society. The Communists, just as the Christian Democrats, had their own shops, restaurants, entertainment places, and entire towns. And it was very rare that a Communist boy or girl would marry into a Christian Democrat family and vice-versa. This structure of the Italian society came back to my mind while reading the paper commented by Bownds (see below) that describes how deep is the Republican/Democrat divide is in the US. Honestly, I wasn't aware that the US society was so sharply divided into two factions, to the point that boys and girls born in Democratic families rarely marry into Republican families and vice-versa (I lived in California for a few years, but that's not the same thing as "the US"). And, yet, after some mulling over, it dawned on me: it is the way societies tend to behave. Do you remember "Romeo and Juliet"? Yes, the Montagues and the Capulets. Then, the "Blues" and the "Greens" of ancient Roman times; the Guelphs and the Ghibellines of Medieval Italy, and so on, all the way to the modern split of Sunnis and Shiites. It is the way things are. These sharp divisions of society bring many problems, even beyond the fact that they often lead to violent conflicts. One is that all debate is ideologically filtered. No matter what's the logic of your arguments, the validity of your data, the rigor of your analysis, whatever you say will be always judged in relation to your membership in one or the other faction. This is something I can say from my personal experience in Italy. A partisan debate is not a debate; you either are with one side or with the other. And if you try to mediate; it is worse. As I came from a "White" family, I found that, politically, I was always mistrusted by Reds as an enemy and by Whites as a potential traitor (and BTW, I married a girl from a White family!). I am not sure of whether the US society reaches these levels, but, from what I read, it seems that the Republican/Democrat debate is as much ideologically driven as it was the Reds/Whites debate in Italy up to the 1990s. In this kind of situation, changing anything in society becomes nearly impossible, because each side has its own rigid worldview and is unwilling to budge from it. This has disastrous consequences when change is absolutely necessary, as it is nowadays with the climate change issue. In the US, by now, the Republican worldview includes as fact that climate change is a hoax perpetrated by evil scientists on the US taxpayers. There seems to be little or no way to change this view. And that's bad(*). So, as scientists we tend to think that by showing the data, by developing models, by being clear and comprehensible, then the message will pass and everyone will understand the risks associated with climate change. But it doesn't seem to work that way: if anything, the republican conspiratorial view of climate change seems to become more and more entrenched. That fits perfectly with my past experience in Italy: the more you argue for your position, the more you reinforce the perceptions of an ideologically minded opponent. Can societies ever free themselves from the deadlock of partisan splitting? Yes, they can and they do. After all, Guelphs and Ghibellines don't exist anymore and, in more recent times, in Western Europe, in the 1980s and 1990s, the Communist parties disappeared or were marginalized in the political arena. What happened was that the entrenched worldview of the Communist parties gradually became totally incompatible with the way society had evolved. As a consequence, these parties disappeared. 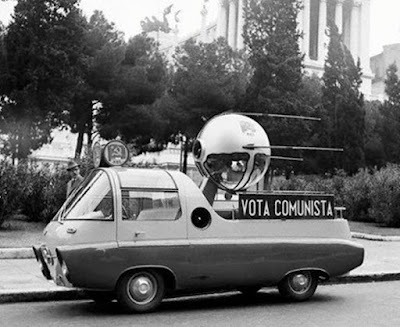 Not that anyone changed their minds: the old Communists remained Communists, but they became too old to engage in active politics (you can still find many of them scattered in the suburban areas of Tuscany, in Italy). At the same time, young people found that the idea of becoming the next generation of party members was most uninteresting for them. Something similar occurred for the Christian Democrats in Italy, although the story is more complex. Not that the Italian society has become less partisan than before (perhaps, actually, more). But, at least, the old "Red/White" split seems to have disappeared. With the onrush of evidence about the negative effects of climate change, it is possible that the worldview of the Republicans in the US will gradually become so dissonant with reality that the Republican party will become an anachronism, just like the Western European Communist Parties. But how long will that take? Hard to say, but if we have to wait for the current generation of Republicans to get too old to engage in active politics, that will be too long in comparison with the urgency of acting against climate change. So, here is the summary by Eric Bownds of the results by Iyengar and Westwood. Worth reading and meditating about. (*) Note by UB: Perhaps we could bypass the Republican opposition to climate change policies by pushing renewables as a good solution for energy independence, without ever mentioning climate change. The risk is that the Republican worldview may soon absorb and include also the idea that renewable energy is just another hoax perpetrated on the American People by leftists and greens. It seems that it is exactly what's happening. And that's very bad. 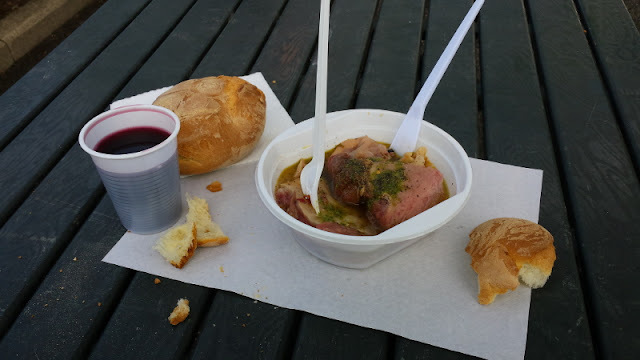 Post-peak Italian food: a lunch with organ meats, bread, and a glass of red wine. The beauty of life is in its small pleasures. If you are not a Florentine, you may be under the impression that the food of Florence is mostly a sophisticated combination of such things as "Carpaccio" and pasta with truffle. But, as it is often the case, reality is in the eye of the beholder. Depending on who you are and what you are doing in Florence, your culinary experience may considerably vary. In particular, given the economic situation, for most local people there is no money left for fancy food. So, the past few years have seen a considerable renaissance of a traditional Florentine food: organ meats sold at roadside stalls. You can see an example of this kind of food in the snapshot above, taken today. This is is a kind of lunch not directed to the average tourist (who is not prevented from trying it, either!). It is popular with blue collar workers and office workers, both categories having been badly hit by the crisis. In comparison to the classic hamburger from a fast food outlet, it is tastier and you see what you are eating. Also, I am reasonably sure that the meat doesn't come from very far away. Whether it is also a healthy lunch, it is, of course, debatable, but I can personally attest of never having suffered ill effects from this kind of food. But, in the end, its fundamental characteristics is of being very inexpensive: it is what makes it "post peak food." Of course, it remains to be seen how organ meat stalls will survive such things as a possible global collapse of the kind I call "Seneca Collapse." But, for the time being, it is one of those small things in life that you can still enjoy. 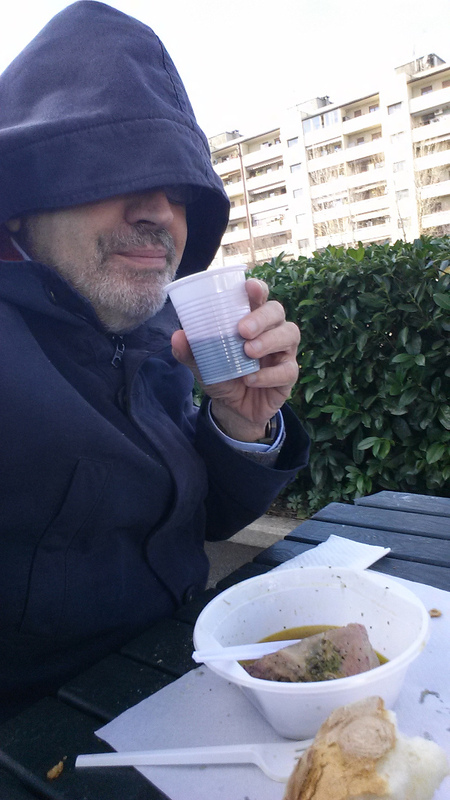 Below, a picture of yours truly, Ugo Bardi, drinking his wine with his lunch, today. Sorry for looking like a jailbird or something like that, it was in the open and it was cold. Also, behind me, you can see a glimpse of the architecture of the place; obviously nothing like the majestic Renaissance architecture of downtown Florence! Note 1. See also some musings of mine on ancient Florentine cuisine from the "Chimeras" blog. Note 2: Several commenters noted the plastic containers. Yes, they are unsustainable and let me tell you more: after finishing your lunch, you are supposed to throw everything, plastics and food scraps (and glass or aluminum if you ordered a beer) into a single container. Not even a feeble attempt at separating the waste in its different components. I asked the sellers why they don't separate the waste, and they looked at me as if I were a nerd (which I am, after all) and then answered me by asking why should they bother. Which I think is significant. We'll use plastic and throw it away as long as we can have it, and then move to something else, as long as we can have it. But recycling plastics? Well, it is for nerds. Art Berman clarifies the situation and wonders why "consumption has increased by one-third and imports have doubled but we no longer need to think strategically about oil supply because production is a little higher?" Here is an excerpt from his post. The Crude Oil Export Ban–What, Me Worry About Peak Oil? The tight oil revolution has returned U.S. crude oil production almost to its 1970 peak of 10 million barrels per day (mmbpd) and imports have been falling for the last decade (Figure 1). But today, the U.S. imports twice as much oil (97%) as in 1974! In 2015, the U.S. imported 6.8 mmbpd of crude oil (net) compared to only 3.5 mmbpd at the time of the Arab Oil Embargo (Table 1). Table 1. 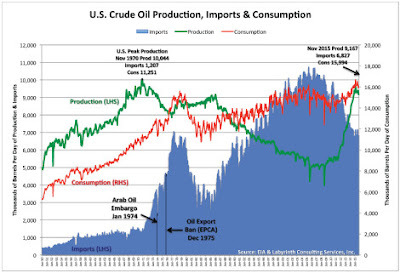 Comparison of U.S. crude oil imports, production and consumption for 1974 (Arab Oil Embargo) and 2015 (Today). Source: EIA and Labyrinth Consulting Services, Inc.
Production of crude oil is higher today by 7% but consumption has grown to more than 16 mmbpd, an increase of 32%. At the time of the Arab Oil Embargo, consumption was only 12 mmbpd. We are far more economically vulnerable and dependent on foreign oil today than we were when crude oil export was banned 40 years ago.